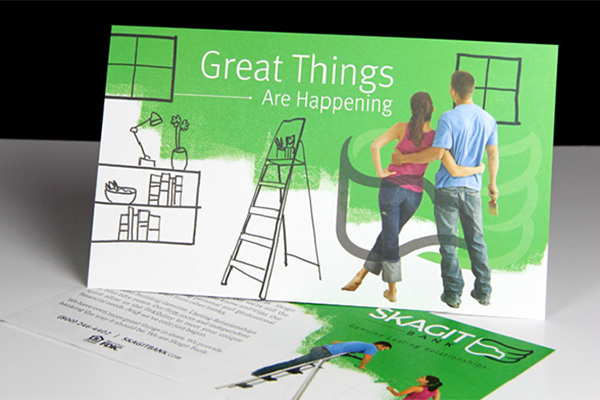 Rebranding is a wonderful and sometimes stressful challenge for both our client and ourselves. At BrandQuery, we follow a process that helps get everyone in the organization on board while also providing great insight into the organization which is helpful to our work. This is where strategy plays a big role. A rebrand can only turn out well if the organization is truly open and willing to really look at itself. 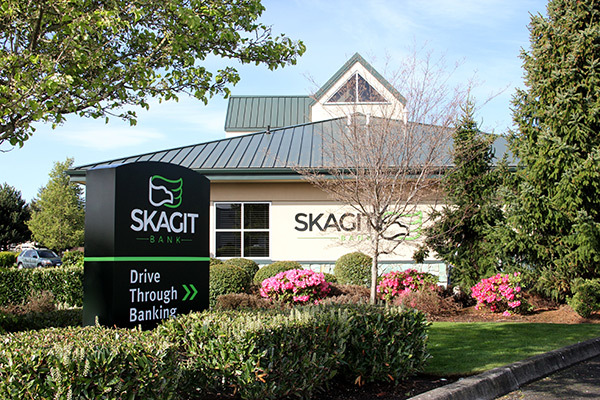 Skagit Bank was such a client and the process was very successful because of their willingness to look at every aspect of the organization. It takes great support and leadership, and that is what we received. 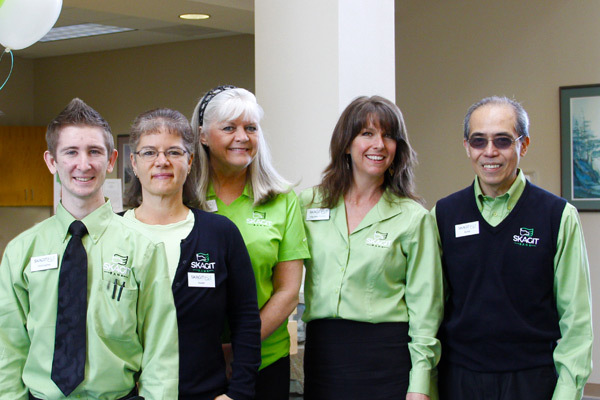 We began our five months of work by interviewing employees at every level, from tellers to senior management. Insight from some of the Bank’s most crucial and sometimes most critical groups can be challenging, yet it is very important. Employees are a big part of any organization’s culture and they are typically the primary point of contact with customers. Successful rebrands need a great culture and employees who are, or become, brand ambassadors. At times there is a need to help reshape an organization’s culture, but that was not the case here. There already existed a great culture that could only be made stronger. 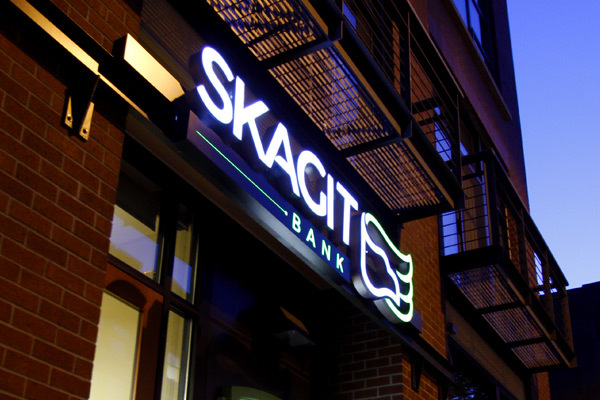 For a little on Skagit Bank, let’s go back. 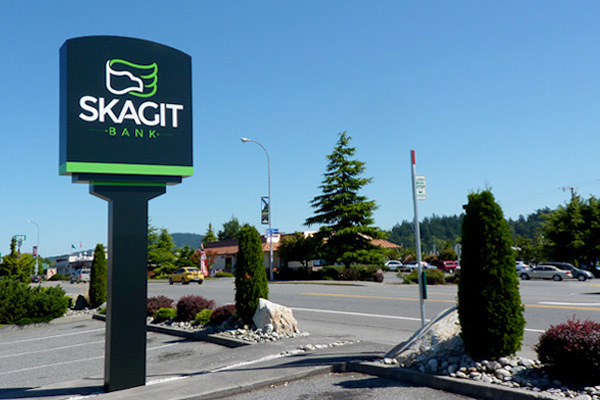 Skagit Bank was founded as Skagit State Bank in 1959 by bankers, local business people and agricultural businesses. The first office was located in Burlington, Washington (Skagit County). James Bishop, Sr. was the CEO for several years. Mr. Bishop was known for his great understanding of a farmer’s needs, at times even climbing onto a tractor to better see things from a customer’s perspective. 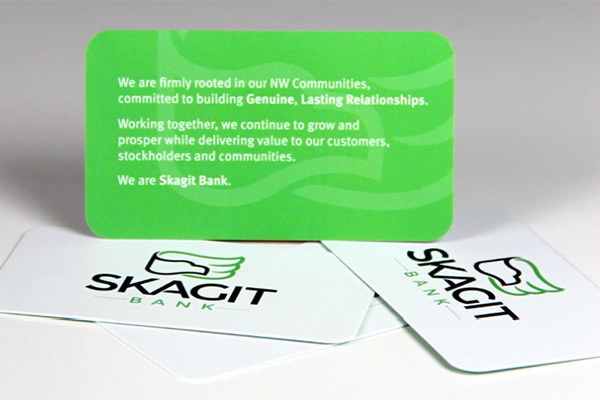 Over several years, the Bank grew to 12 offices located in Whatcom, Skagit and Snohomish Counties. Product offerings grew as well, and their employees’ friendly demeanor and strong customer care made them a favorite of local people. Today, Mr. Bishop’s daughter Cheryl is the CEO. She and the board of directors recently appointed Russ Lee as President and COO. Mr. Lee is well experienced in banking, having spent his entire career in the industry. Ms. Bishop and Mr. Lee have combined to be a powerhouse team in local banking. Over the course of the next five months, we met several times with a small committee that included Ms. Bishop, Mr. Lee, the VP of Marketing and the VP of HR. At the beginning of the process, we requested a committee of three to five people. We also stated the group could not change, that whomever was there in the beginning would be the same as was there in the end. Each participant gave invaluable input and insight. These meetings were essential to the “30,000 foot” perspective, one that includes goals and vision for the business, yet they were also good in adding to the ground floor version, the one gained through the employee interviews. Once the interviews were completed, we summarized all of the information for review by the committee and for our use in developing the new branding. 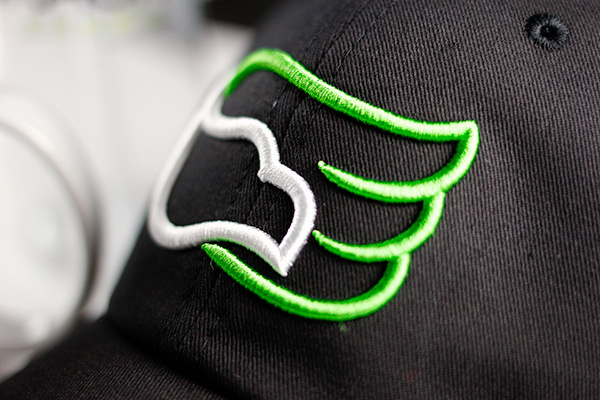 When it came down to the actual design work, we began with the development of a new logo. We presented concepts to the committee and they selected the one that is now in use. The committee’s decision process was one of the best we had ever experienced. They were decisive, and they stood by their decisions, never wavering. 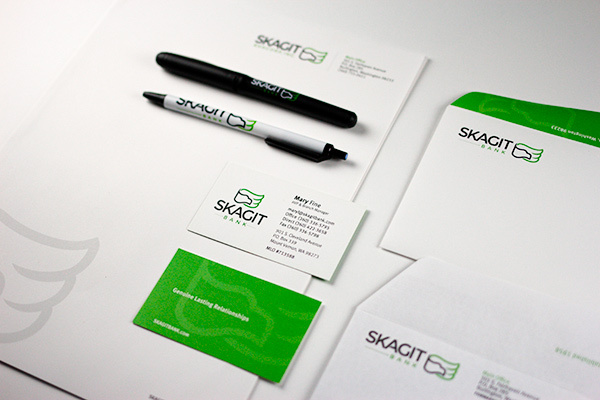 Decisiveness continued as we worked through and designed all of applications of the new identity. 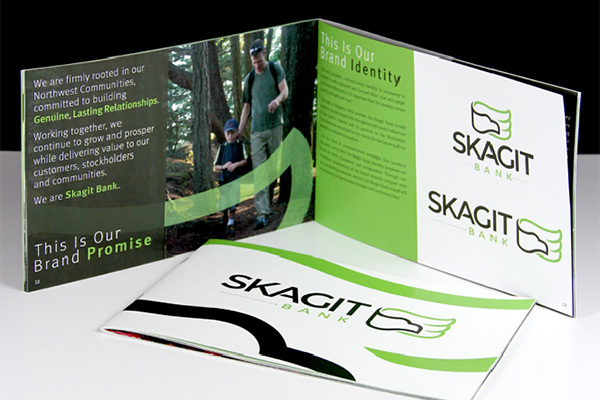 Following the logo design, we developed the brand statement and the Bank’s new tagline. These two items were developed from the interviews. They may not have been spoken directly as such, but the message was the same. We made it more concise and easier to speak. The brand statement and tagline are stronger this way, because they are not something we thought up and imposed from the outside, but something that came from them, something within the organization that they all already live by. From here we went to work at BrandQuery and rebranded so many items, it’s tough to count – one of our most important elements was all of the Bank’s signage, as this would set a statement on the street. We were working against the clock at this point as signage is not a quick production item. All locations were audited, new designs presented, fabrication details specified and then sent out to bid. We were happy to have received several bids back and were able to select a vendor who was able to fit into our budget and install all signage within our launch window. Another major rework was the Bank’s website. We studied other banks and their approaches. We were really surprised to see how many bank websites are not current in appearance, who don’t incorporate responsive design (the ability to view the site on multiple devices in a manner that is optimized for different screen sizes) and other usability issues. 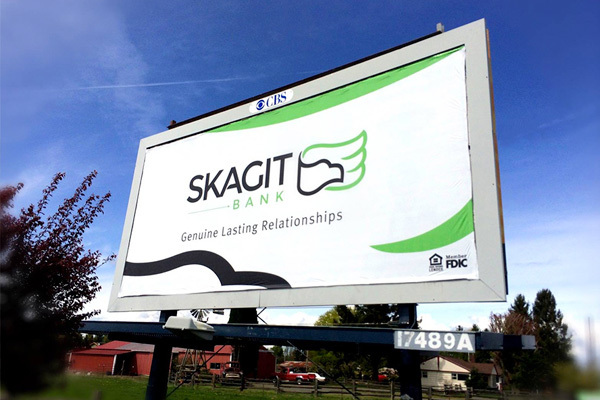 BrandQuery developed a site Skagit Bank was excited to launch. 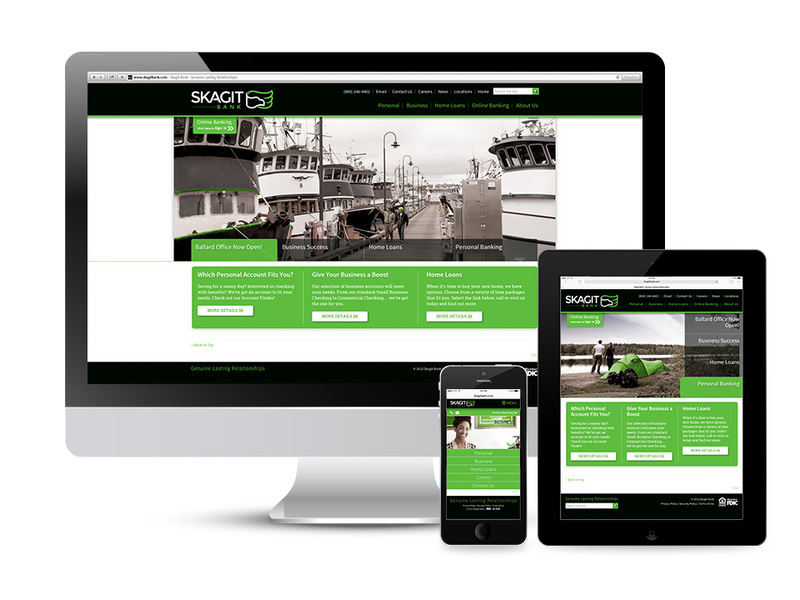 It is more current in appearance than the majority of bank websites today, it is responsive, and it is easy to use. 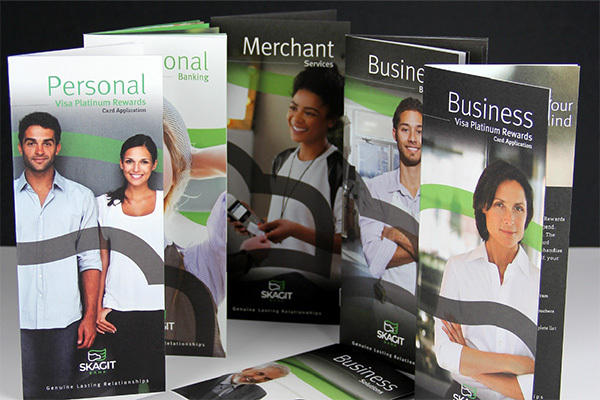 One of the best design projects in the rebrand was the redesign of the consumer and business debit and credit cards. 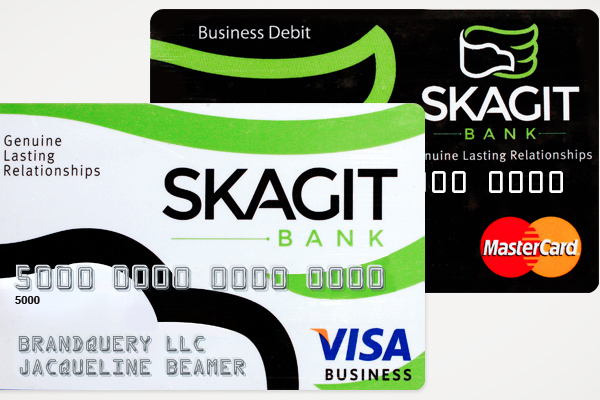 Research has shown, the more people like the appearance of their debit and credit cards, the more they will use them in transactions – a strong benefit for Skagit Bank. 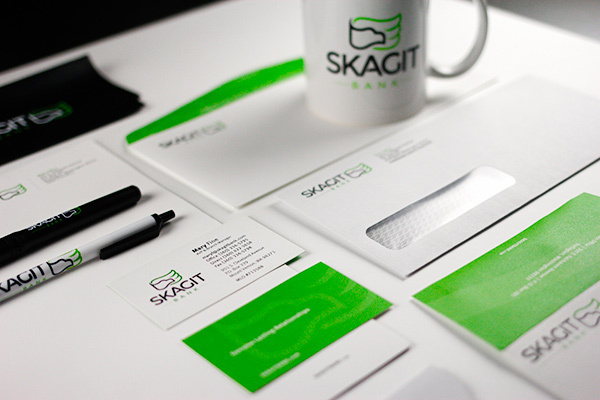 Ultimately four different designs were selected (consumer debit and credit, business debit and credit). They are now being distributed either by request or upon expiration. 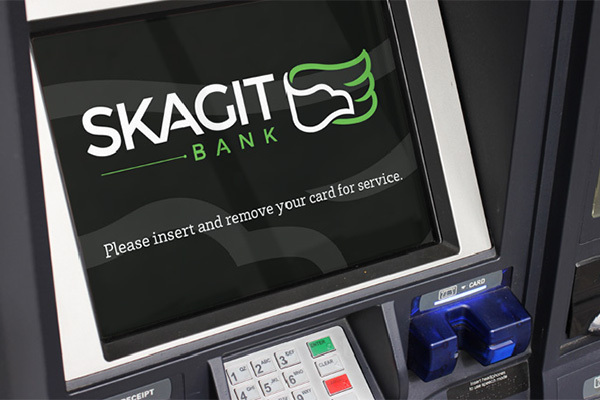 Then there was a rebrand of the ATM screens at all bank locations, all consumer and business brochures, interior signage systems, interior graphic work and more. A really fun part of the project was in branded clothing. We were able to select a variety of shirts, blouses, and sweaters, all of which worked together and complemented the logo. The employees not only are proud of where they work, but are now able to show it. 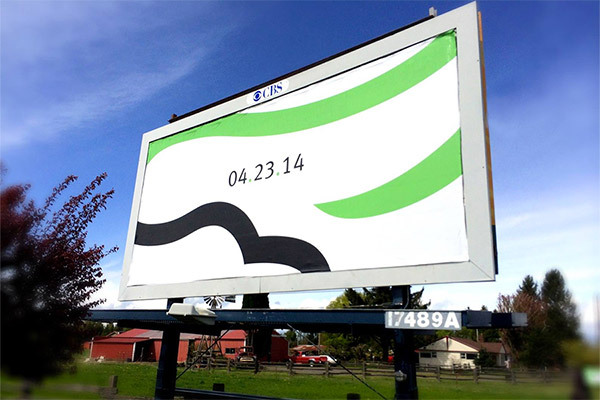 Prior to the shareholder launch, BrandQuery helped facilitate an internal launch. Internal launches are important to help employees continue to be a part of the rebrand, to keep them up-to-date and to provide them with the messaging and materials that will move the rebrand forward. A month later was the annual shareholders meeting where all was unveiled – this was followed the next day by the official public launch: signs went up, billboards changed out, the new website launched, and employees wore their new branded clothing; it was an exciting day for all, and one BrandQuery was proud to be a part of! 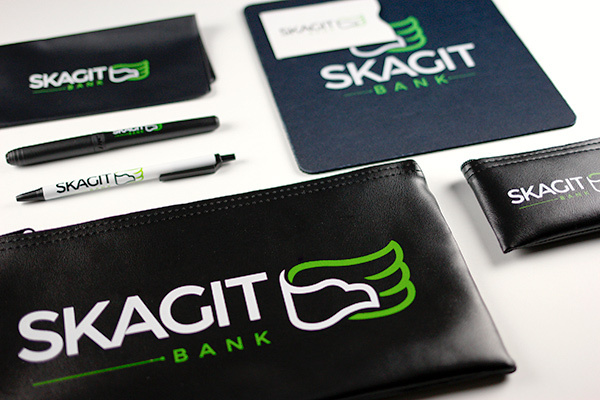 Thank you to Skagit Bank – to Cheryl Bishop for trusting us to do a great job for them; they deserve nothing less! 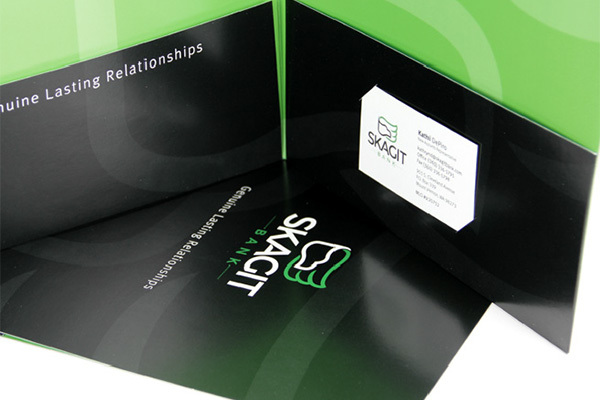 View a collection of our case studies from Branding Identity & Applications, Environmental Signage and Web/Mobile Development.